Infrared light is an important energy force that promotes healing by boosting your immune system, eliminating toxins, and providing a passive cardiovascular workout. Greater immunity means greater health and a better quality of life. Far infrared therapy can provide an increase in collagen production, relieve muscle spasms and joint stiffness, increase blood flow, assists in resolution of inflammation, expedite weight lose, reduce hypertension and increase circulation. Far infrared therapy has been used for decades world-wide as a beauty treatment because of its ability to reduce cellulite and produce amazing improvements in skin tone and texture. Defined as “the therapeutic use of color and light in order to bring about homeostasis within the human body.” Our sauna at Prema is equipped with a chromotherapy light system. Our organs, muscles, cells and nerves all have a level of vibration or frequency. Each color of light has its own frequency and vibration. When our bodies become out of balance, disease occurs. Through extensive research, we know that color and light will help bring our physical and emotional systems into balance. Color works through and in us, in every nerve, cell, gland and muscle. Toxins can play a significant role in preventing us from losing weight as well as increasing weight gain. The body will create fat pockets to store chemical toxins when they exceed the body's ability to excrete them. Those who have been unsuccessful at dieting, often times have a toxicity problem and will find success after using a far infrared sauna to eliminate the stored toxins that can impede weight loss. Those wishing to lose weight should also note that the cardiovascular effect from a single sauna session burns as many as 600 calories. Far infrared heat therapy is an extremely efficient detoxification method for eliminating harmful toxins, acids and heavy metals from the body. Sweating is the most efficient way to remove toxins from the body by using our largest organ – our epidermis (skin) to shed all kinds of impurities. By dilating blood vessels, far infrared heat increases blood circulation to injured areas to speed the healing process and relieve pain. Infrared heat has also been used extensively in the treatment of arthritis, rheumatism, fibromyalgia, carpal tunnel and muscle and joint pain. Reduce or eliminate the need for pain medication with all natural thermal therapy. High daily stress levels put constant strain on the body's nervous system and can contribute to chronic disease. The far infrared sauna helps to reduce physical stress by boosting circulation and triggering the production of endorphins, the "feel good" hormones. Far infrared therapy can profoundly reduce everyday stress and tension, as well as reduce or eliminate insomnia and promote more restful sleep. Sauna treatments dramatically renew elastin-collagen tissues, improving the look of crow’s feet, forehead lines, wrinkles, scars, varicose veins and stretch marks. All of the benefits of this thermal treatment show up on your skin. Skin conditions like acne, dermatitis, eczema and psoriasis are soothed and erased. Infrared energy purges clogged pores, neutralizes infection and hydrates skin. You will love the soft smooth glow of your naturally clear complexion. Cellulite is a gel-like substance made up of fat, water, and waste products trapped near the surface of the skin. Far infrared heat actually breaks down the water clusters that contain fatty cells and toxins and allows the body to sweat out this cellular waste through the pores of the skin. When the body temperature reaches 100 -103 degrees F, the resonant absorption effect literally melts fat and cellulite while you sit and relax. Far infrared therapy has been applied as cancer treatment worldwide for 20 years. Far infrared saunas increase the production of white blood cells, killer t-cells, and interferon, which fights cancer cell growth. Healing time for damaged tissues, muscles, tendons, ligaments and nerve endings is greatly reduced. Increased blood circulation and vasodilatation of blood vessels speeds beneficial nitric oxide and healing oxygen to the distressed areas, while removing toxins and lactic acid. Enhanced cell regeneration will give you more energy, stamina and mental clarity. Post workout recovery times are shortened. 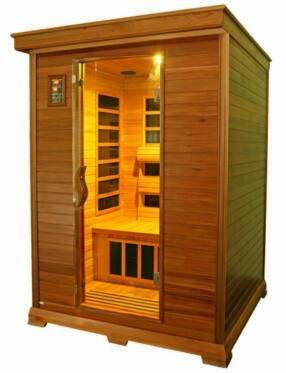 Please check out this website for more information or to purchase your own sauna.